We added a new feature that allows you to change you're username! You no longer need to contact a staff member to change your username! Your username can only be changed once every 30 days! | How to change my username? 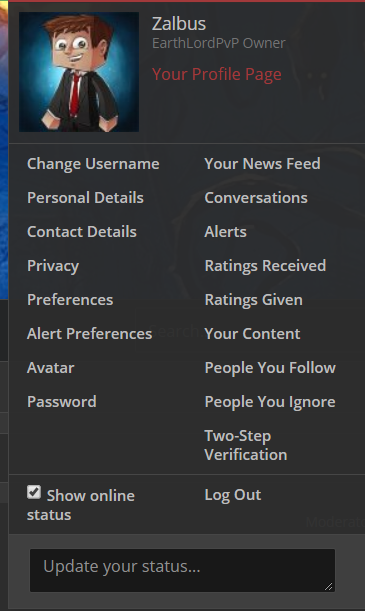 Press you're name near alerts and inbox. Then put the username you want to be changed to. You can also view the history of someone's usernames by going on there profile and clicking "Username history"
NOTE: All username changes have to go through moderation. We are here with a event on the Skyblock realm. Anyone can join it! This post will have all the details needed for the event! Just so we do not need to check the whole server you will need to Comment you're In-game username so we know you are trying out for this event. All normal rules do still apply in this event. 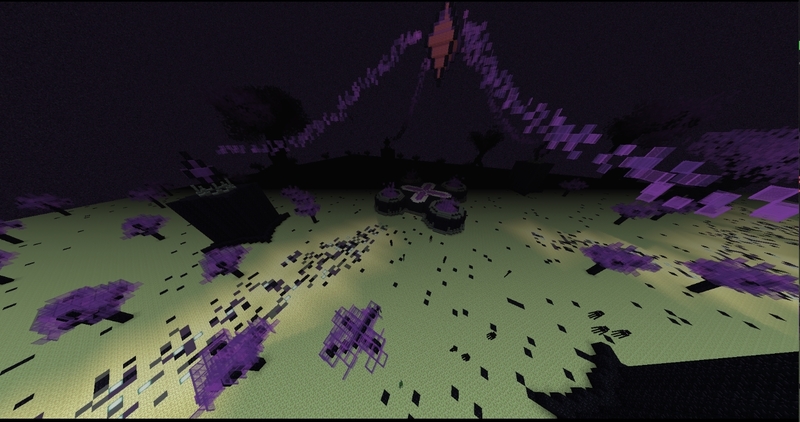 The Bosses will spawn around the warzone It will announce the coords that is spawns at. Same rules as before as now they have a bit more room to use there amazing powers! You will now be able to build in the end but wait! Don't worry You cannot get to the void as flat bedrock below you and a bedrock boarder The end is 8000 x 8000. You will not be able to get to the void so do not worry about void bases. Go check out the end! Maybe make you're base there! We feel we should add this as it gives you more of a hiding spot to hide you're base, the end doesn't have all this bumpy land and the end is only 60 blocks deep! UPDATE October Announcement | Factions revamp, Staff changes & more! Hi guys! What an eventful month! Our first other gamemode has been released, and while we are still fixing certain bugs, as expected of a new gamemode. All staff are also no longer restricted to have matching nickname colors with their tag -- the only requirements being that their names must be a visible color. UPDATE EarthLordPvP | Kanium Factions Revamp and more! We feel factions has died down due to Skyblock and factions needs some work, We will be revamping factions and resetting it to make new players come and join! Hi guys! Time has flown us by and it is time for the Skyblock release, But first we have some changes to the faction realm! No longer can large factions claim half the map in chunk buffers to protect their bases. In simplest terms: a 20-chunk radius limit will now be applicable to all bases. Factions are not allowed to claim more than 20 chunks from the center of their base, meaning that regardless of reason, there cannot be over 40 chunks claimed consecutively by the same faction, or that faction's alts and alliances. If you see factions that are breaking this rule, please report in the reports section. From the moment this announcement is made, 24 hours will be given for players to settle their buffers. Factions will be warned for their first offence, then action will be taken - including forceful unclaiming of land, temporary bans, and even disbanding of factions who repeatedly break this rule. 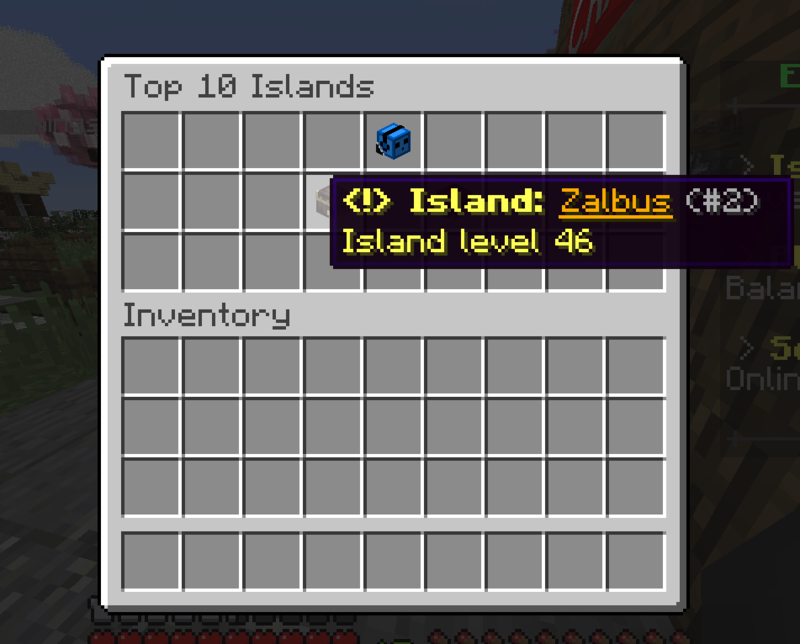 This is the information for our BETA For the 1.0 Skyblock realm. Your role as a beta tester is to try and find as many bugs as possible. Despite the amount of work put in, there are still little things that the management may have missed here and there - that's where you guys come in. You play a very big role in making sure the next few months of gameplay is fair and fun for all players involved - that's a big role! It is your responsibility to report all and any bugs or exploits that you find IMMEDIATELY to a staff member, even if it's just a suspicion. Anyone caught abusing these bugs, for "testing" or otherwise, will be subject to punishment. BETA: Players enter as per normal players would in the real Skyblock for the first 12 hours, Then infinite money will be given for the other 12 hours. ANNOUNCEMENT New staff recruitment, Promotions, and More! Hello! Everyone the time has come and it is time for the staff wave to come. Please welcome all of the staff members and give them some time to get used to their new position and listen to them how you would listen to me or anyone else on the staff team. Enough talking. Here is our list of our new recruits, new promotions and sadly demotions! These people have worked very hard to join the team and prove they are loyal. Please give them a nice warm welcome! These staff members have worked very hard and have been rewarded with a promotion! Please congrats them on the promotion if you see them! My name is Nurdeh, and I am the new Community Manager of EarthLordPvP! What is a Community Manager, and what do they do? Advertising: As a Community Manager, I will try my best to grow the community by advertising. I will be posting the server on various forums, server lists, and much more! Advertising is essential to building a successful server and community, and I will try my best to grow the community in count and in spirit. It's been a wild ride this past month! All the new things that have happened! And don't you dare think it's coming to a end! We are just getting started! What would a monthly announcement be without us recognizing the Top Voters of the last month? Let's put our hands together for the Top Voters of August! To all of the dedicated players above who have put in the extra effort to keep our server at the top: Please send me a PM to claim your voting prize within 48 hours, mentioning your in-game username.